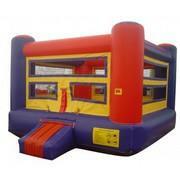 Boxing Ring – When you imagine the perfect party rental for all your guests, what do you imagine? Do you imagine giving an interactive, compelling and engaging experience that makes your guests feel like they're lighter than air? Does your experience allow them to compete in a safe environment? About to Bounce inflatable bounce house and Inflatable waterslide rentals has the perfect solution for all those young minds looking to fly through the air and expel their kinetic energy that youth has imbued them with. This is one party rental that plays out exactly how it sounds. In a large 12x12x10 space, your party goers will enter a safe bouncing area to make sure no one gets hurt as they bounce around and have wild airborne adventures. At $184 for a five hour rental, this is one energy burner set to take your party to the next level.